At Greener Pastures Veterinary Service, we strive to provide you the best possible preventative and diagnostic care. Our state-of-the-art equipment and specially trained staff are ready to help you prevent many of the diseases that threaten our 4-legged friends. We are also equipped and staffed to respond to the unfortunate sicknesses or emergencies that may arise for our established clients. 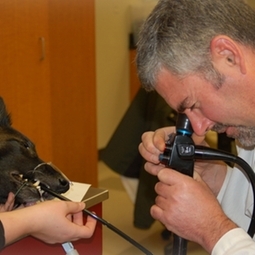 We have an in-house lab where we can perform many of the diagnostic tests that will allow us to quickly understand what is going on with your pet. We also have a great relationship with an outside lab to perform the more extensive testing we are not equipped to do. We also have a Veterinary Chiropractor and Rehabilitation Specialist on staff to help your pet recover from illness/injuries and improve their mobility and quality of life as they age. Your pet is an important part of your family, and when he or she is ill, you want the best medical care available. The veterinarians and staff at our clinic are ready to provide your pet with cutting edge veterinary medical care. From wellness exams and vaccines to advanced diagnostics and complex surgical procedures, your animal will receive high quality care at our hospital whether he/she is a dog, cat, cow, horse, goat, sheep or pig!